Here in the so-called “Buckle of the Bible Belt,” home to around 540 churches and the main offices of major denominations but also to dive bars and honky tonks, Nashville is a study in contrasts. Houses of worship are so ubiquitous that when the Bridgestone Arena was built, the Metro Council had to grant an exemption to the ordinance regulating how far an establishment had to be from a church in order to sell alcohol. Just outside from the Arena there lies another string of hallowed halls. From Tootsies to Robert’s Western World to Ernest Tubb’s Record Shop, Nashville’s secular temples are graced by the pantheon of country music deities singing songs of heartache, the hardscrabble lives of the rural poor both white and black, and the wicked mistress of whiskey. Across Broadway from the Bridgestone is the Ryman Auditorium, the site of the original Grand Ole Opry Radio Show; while the hockey arena may be the bigger venue, there is only one “Mother Church,” the Ryman. When Bono raps sentimental about the short distance between Saturday night and Sunday morning, he is thinking about places like Nashville. On weekends, partiers and the dreamers descend onto lower Broadway and their late Saturdays bleed into the early morning dawn of Sunday. Then, the many churches will open their doors in hopes that a few bleary-eyed prodigals may stumble upon them. Like many former Western territories of the early days of the nation, Tennessee is shaped by the legacy of camp meetings where itinerant preachers would come to frontier areas to preach, pray, and lead hymns. People from surrounding areas would come to the site of the meeting to camp-out and engage in the temporary community at sunset, where the darkness of the temporal would be visited by glimpses of the light perpetual. The cultural purchase once held by these regular Southern summer events have long since given way. They are in many ways the precursors of the cultural event that has taken their place, the rock concert. Into this liminal space where the boundaries of secular and sacred collide and collapse, enter the Irish rock itinerant teachers of the musical message. 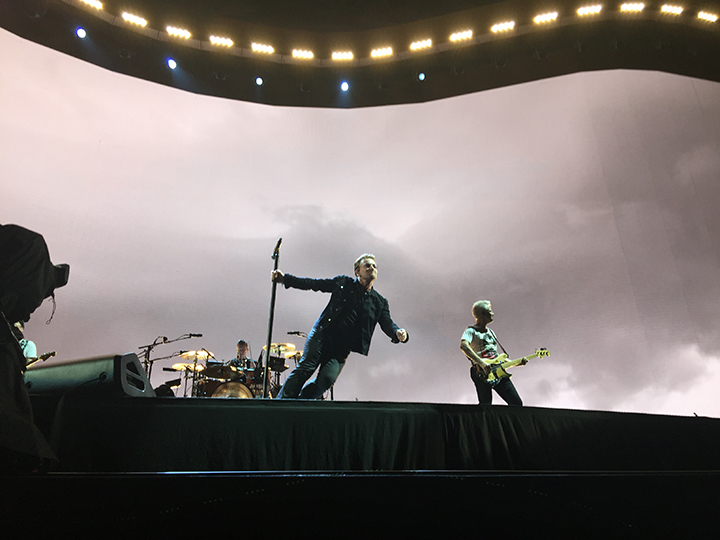 U2 descended upon Music City for a night of hard-charging rock n roll, unafraid and unabashed in its explorations of the ecstatic, religious, or otherwise. 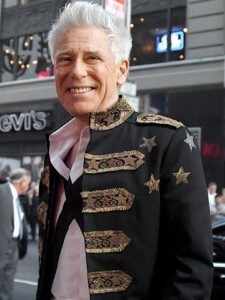 Like the schizophrenia embodied in the family tree that holds both the Pentecostal snake charmer of an evangelist, Jimmy Swaggart and his cousin Jerry Lee Lewis, “rock n roll’s first great wild man,” U2’s showman careened back and forth, embodying both the sawdust of the revival tent and the beer-soaked pianos of the honky tonks. While few gathered in that arena were experts in English Romantic Poets like Blake or with the intricacies of the religious and socio-political environment of Ireland during and in the aftermath of The Troubles, we still get it. Our familiarity with the Southern gospel evangelists and the dramatic effect of the “personal testimony”– this common religious imagery of everyone’s rise and fall– provided a foothold for the band to invite us beyond our disappointment and cynicism into a transformed vision. This is the key to the power of this show and the band’s latest album. What happens after the fall? When our hopes for harmony are dashed? When our falls and failures, large and small, awaken us to our own darkness and weakness? Can we risk belief again without succumbing to magical thinking? Can we accept loss and defeat and our own finitude without crippling despair and proclaim that this is “no time not to be (fully) alive”? 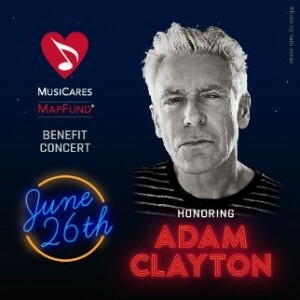 The concert leans heavily on the band’s latest record, Songs of Experience, with songs from the album bracketing the rest of the set, roughly divided to open and close the show as invocation and benediction. 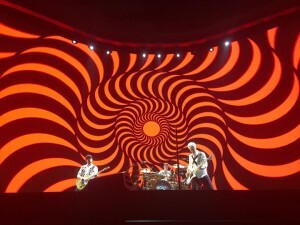 Themes of darkness and light run rife through the album and define the show, both in song selection from the greater U2 catalogue, as well as the stunning video display and visual props. The show opens with images of an MRI brain image and vocal instructions to breathe in and exhale. The scan itself (and Bono’s elusive hints at a brush with mortality) raises intriguing questions. But looking back on the whole concert experience, we now see these breathing instructions and startling images as a corporate invitation to enter into our own personal fragility and collective interior, where darkness and mystery exist even as we face illumination. The grand power of the second act took us into the depths of darkness both personal and collective, without providing an easily demarcated boundary between them. Earlier in the show, U2 refigures the militant call to arms of Sunday Bloody Sunday as a mournful dirge, a concession and confession that the forces of darkness are not always vanquished by the sheer force of will and passion. 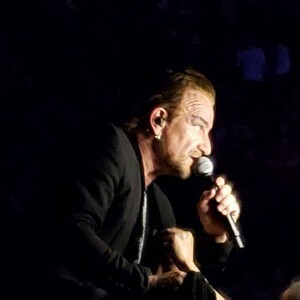 Before an acoustic version of Staring at the Sun, Bono reminded us that the song might be about a form of willful blindness, the kind that can destroy a nation. Without warning, the song is accompanied by the ugly images of raw racism and xenophobia in Charlottesville and throughout the country. By the time the giant screen that runs the length of the GA area displays the two large Confederate flags waving in slow motion, the visual gut punch is followed by the lyrics’ uppercut. We find that we’re not the only ones staring at the sun, afraid of what we’d find if we took a look inside. Somewhere in this late Southern Saturday night, I can somehow hear the faint sounds of a gospel choir warming up for Sunday morning: “It’s not my brother or my sister, but me, Oh Lord, standing in the need of prayer.” Truly, middle Tennessee needs this kind of purge and prayer, no matter how difficult it is to face our demons. 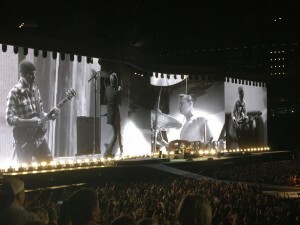 As Staring at the Sun gave way to Pride and the images onscreen transitioned to civil rights marches and Black Lives Matter, it is painfully clear that those gathered (overwhelmingly white and middle-to-upper-middle-class) more closely resemble the faces shown during the previous song, rather than the latter. Will we heed the voice of a James Baldwin when he reminds us that “People who shut their eyes to reality simply invite their own destruction, and anyone who insists on remaining in a state of innocence long after that innocence is dead turns himself into a monster.” We too often find ourselves as “acrobats” who talk like this, but act like that. A moment of decision is before us. Knowing what we know from this journey of experience, can resistance be mounted and innocence be re-discovered? On first listen to the album, I thought that the opening chords of Get Out of Your Own Way sounded like the opening of Beautiful Day, but it’s placement in the setlist, leading us toward the climax of the concert is a herald that a new dawn may be possible, despite the lack of guarantees. Kendrick Lamar’s presence on American Soul offers a peek at what might be meant by gaining wisdom and good company, as we examine the play of darkness and light in ourselves, opening up to honest communion with voices and experiences that might indict our complicity. Like the narrative arc of the revival, we have been brought to the moment of spiritual decision, but the invitation is not given with any guarantees, no quick fixes or tickets to exit (and thus) ignore this world. Instead, the band has led us from innocence through experience, only to ask us if we can risk the hope of innocence again. This risk is a way of reading our lives in and through the messiness of experience—and through its ambiguities, losses, and failures—making a wage of faith beyond faith, without guarantee or, many days, without any rational justification for it. The closing trio of One (Invisible snippet), Love is Bigger Than Anything in Its Way and 13(There is a Light), this sequence is one of the more subdued ends to a U2 show I have ever experienced, and because of that, and not in spite of it, it may be one of the most impactful. Before singing 13, we are reminded that this is a prayer for our children, both biological and for the larger village of youth who go on before and after us. Our own journeys have limits and calls to let go. 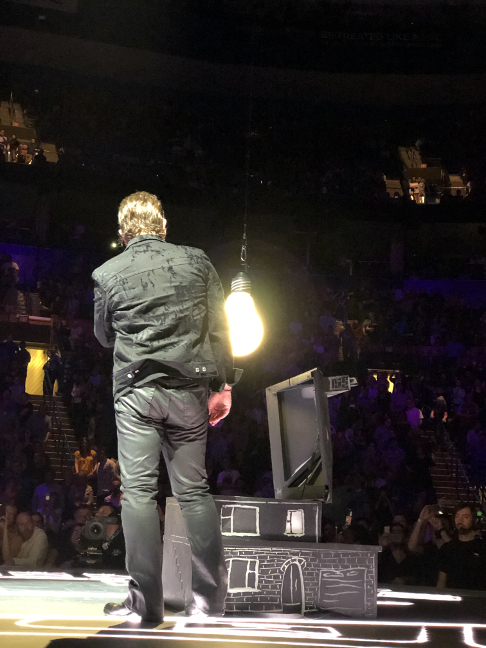 As Bono works his way meditatively down the catwalk to reveal and release the single bulb hidden inside the miniature replica of his Cedarwood house, we see that the grand gesture of love often seems humble and small. It is a less dramatic gesture than when he would leave the baby spotlight illuminating the arena ceilings during 40 when they closed the 1987 Joshua Tree shows, but it is no less impactful. We’re on the other side of the desert now populated by Joshua Trees and far past the searing heat of experience and doubt. We can’t go back to that time or gesture, but this show does not leave us despairing. There is too much we can’t deny. There is a darkness, both within and without. But there is a light; don’t let it go out. Special thanks to Torrey Viger, Colleen Grattan, & Jeff Koss for the Nashville pictures! Love is all we have left, after sitting around in airports all day, trying to get to Tulsa for opening night. Love is all we have left, we will need to wake up before dawn to catch another flight to St. Louis for the second night of the tour. Love is all we have left, after all the money we will spend on this touring hobby this spring. Love Is All We Have Left, what a moving call to worship and call to action with which to begin this show! Many of us fans travel just as hard as the band, investing crazy amounts of spiritual and financial investment into making this happen. Put “Hey I’ve been waiting to get home a long time” from Lights of Home in conversation with “You can’t return to where you’ve never left” from Cedarwood Road, and we are all just visionaries and vagabonds, finding home wherever we hang the tour lanyard. Or we are all just homebodies, traveling only in the comfort of our headphones, catching the show because of someone’s generous livestream. U2 simultaneously cultivates the rooted and the rootless in its restless but committed fanbase, and this time. Due to the continuing emotional content, it’s not fair to call the “innocence suite,” in the first part of the show, safe or lazy. We need not compare this tour to other tours. 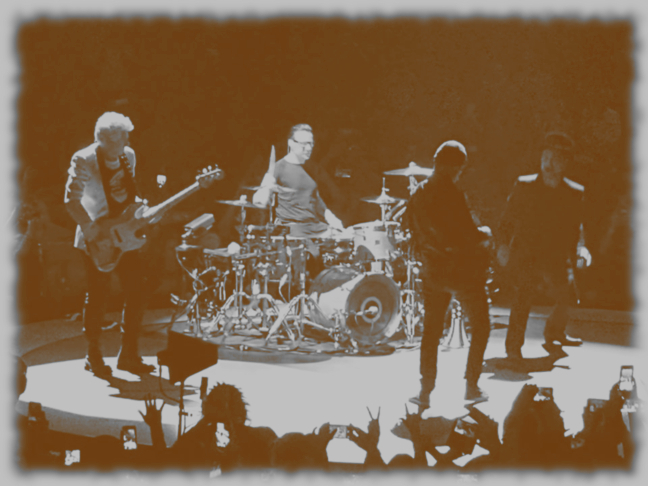 U2 have participated in plenty of revivals of past themes on subsequent tours, it’s just that the interlocking reprises of Innocence into Experience exist in more intimate reciprocity than any precedent in the band’s touring career. The second set shocked us though, shaking up any reticence that this tour would tame the tragic resonance of its content. 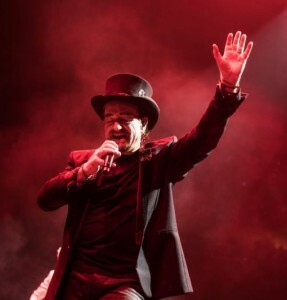 By the time the crackling crunches of Vertigo gave way to Desire, we all recognized Bono was in character, and the band had descended on the small stage for a sinister and surreal circus act, a punkish pentecostal tent revival. From the shimmering sequins on his tuxedo jacket to the over-the-top tophat, Bono incorporated elements of his tortured B-movie taunts, last seen during Exit on JT30. Before we were greeted by the return of the MacPhisto character made famous during ZooTV days, I caught traces of James Franco’s version of the Wizard of Oz. No matter who this madman was, he looked like a washed up carnival barker who had nibbled a little too much of the brown acid at Woodstock. Before going all Juggalo face with the heat of horns and hate, we got a little desperate preaching about the lusty and greedy elements of Experience. This experience is not the mature sage wisdom of middle aged rockstar do-gooder, no, but the raw confessions of a rock bottom moment, about to get sucked into a satanic salon. When MacPhisto fully manifested his screwtape manifesto, it was even darker than the sepia-toned anti-Trump moment last summer. He snarled out his dramatic reading from the dark side: “I’ve been a busy little devil. But you’ve made it all so much easier for me these days. The truth is dead. 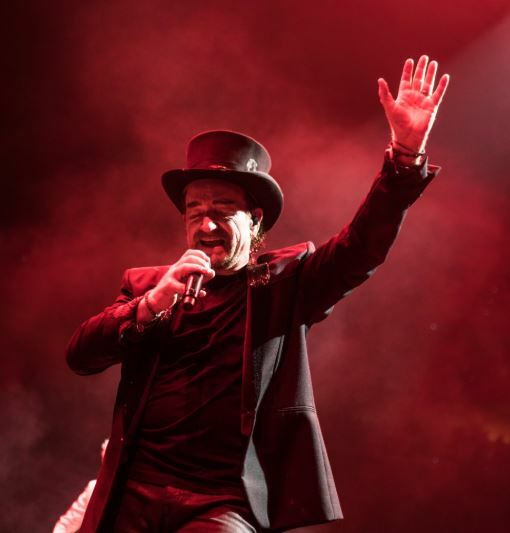 When you don’t believe that I exist, that’s when I do my best work.” The liberal naive notion that if we pretend evil does not exist, it does not exist, is turned on its head by a man who has called himself a radical centrist; insofar for Bono, the center is God not humanity. The short speech might make your hair stand up. These are not the happy chillbumps of Where the Streets Have No Name, but the theological recognition that evil has name and goes by many names. My name is Legion, for we are many — a stunning warning from the holy scriptures comes to mind. All this fused into a smoking live debut of Acrobat. This is one of those times when you pinch yourself, to say you were there. Although Bono and the shows visual designers are always on-point with activist messaging, this show might have been the most adamant call back to the barricades of nonviolent resistance I have ever seen at a U2 concert. From before and throughout the show, the screens scrolled agitprop posters that suggest somebody in the U2 creative team knows that this tour falls on the fiftieth anniversary of the May 1968 uprisings in Paris. “Respect Existence or Expect Resistance” is only one of many radical memes seen on the screens. Even though some of the overt visual references to the neo-nazis and alt-right in the show were traumatizing and triggering, they set up what might be the most riveting version of Pride in that song’s illuminated history. 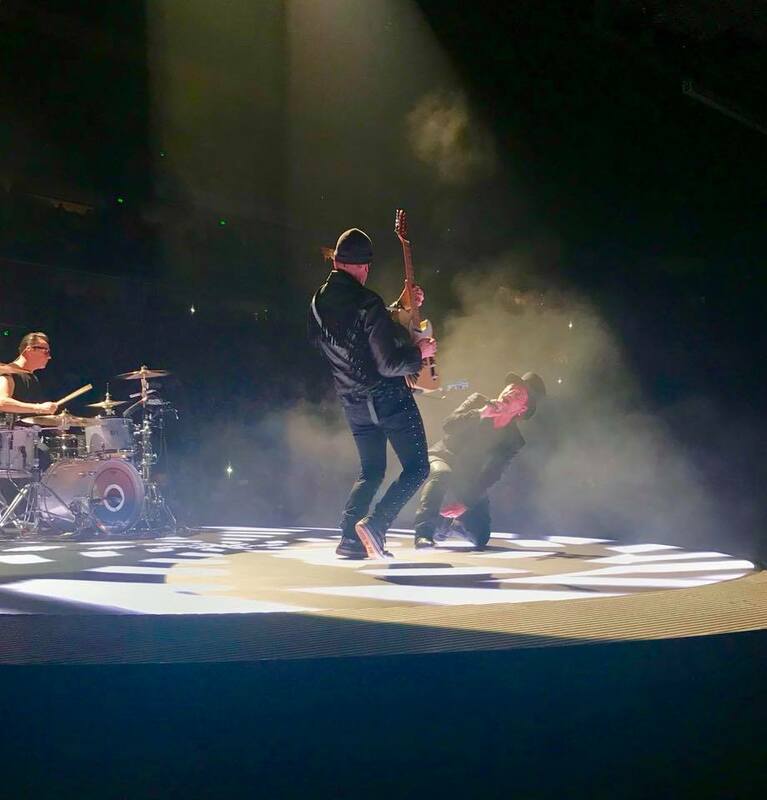 The band stationed themselves at the corners of a quadrilateral filling the arena floor, and the house lights went up; it was mesmerizing church in a new way, for a band that is always finding ways to make church happen in hockey arenas. It healed just a little, taking our breath away after the first part of the second half left us broken. 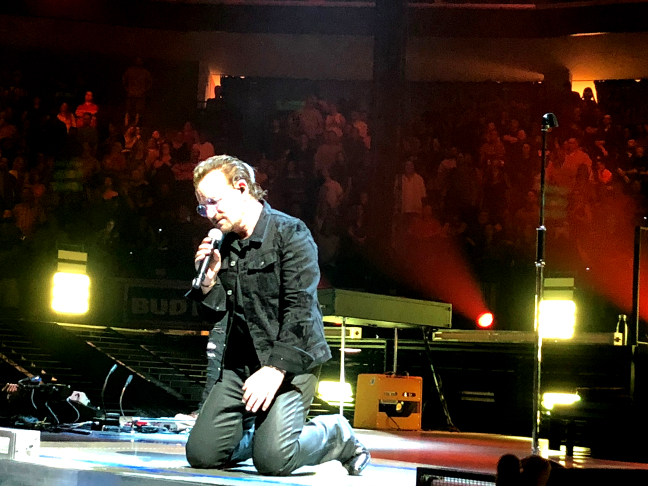 American Soul and Love Is Bigger Than Anything In Its Way are used as American prayers to pull U2’s adopted second country back from the precipice. We still don’t know how it is going to turn out, but Bono recited the Declaration of Independence as reverently as he recited the 23rd Psalm earlier in the show. While last year’s stadium tour was a classic rock victory lap, this is a serious show for serious fans. 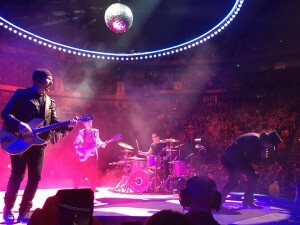 The new set is a lone light bulb at the end of a dark alley, and if we participate with open hearts, the usual joy of a U2 show also wrestled with elements of grief and sadness and vulnerable uncertainty. We will be back to explore these regions of reckoning as the tour continues. 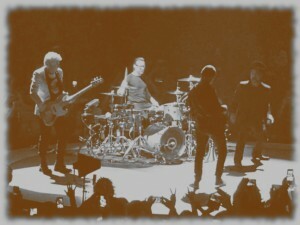 U2 beats the heat & rain & wins over the “two Floridas”! During the current Joshua Tree tour, perhaps no pair of stops would be as intriguing as Miami and Tampa, embodying the “two Americas” theme of the album and theme of these times. The state of Florida is as different and diverse as any state in America. Taking the famous I-4 Corridor that connects Orlando and Tampa as a separator, North and South Florida are geographically, culturally, and politically different. Here in the same state, we have different political bases as “red” as Texas (Central and North Florida) and as “blue” as California (South Florida). Every election year, the Sunshine State is an all-important ‘tossup’ state. 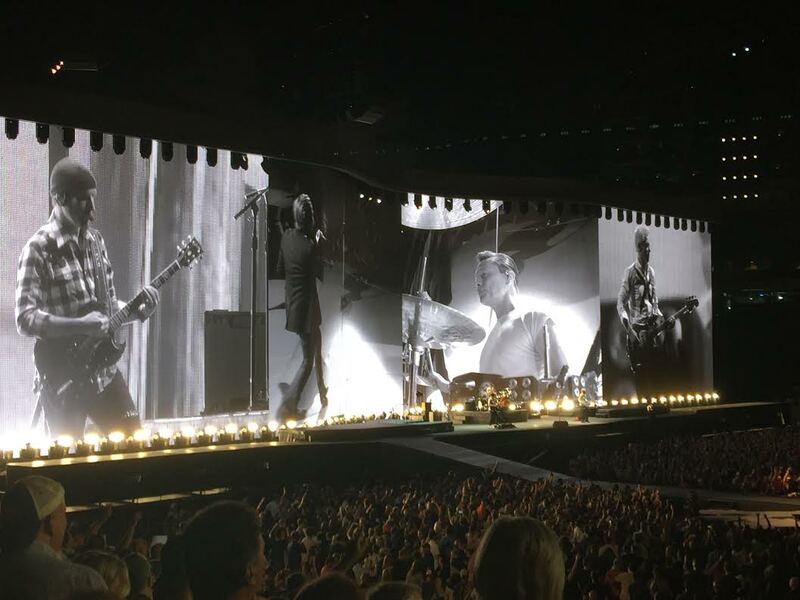 Catering to both demographics in the span of 4 days (Miami’s Hard Rock Stadium on June 11th and Tampa’s Raymond James Stadium on June 14th), the Irish lads brought their sold-out Joshua Tree tour here after a month on the road. Now, the setlist has been polished, the transitions are perfected, and the show sears and soars like a well-oiled machine. In Miami, the summer humidity didn’t stop 60,000 faithful from packing every seat of (the aptly named) Hard Rock Stadium where Larry Mullen Jr got the party started at 8:45 pm. With an energy coming from fans who came from what seemed like every South American country, the band channeled that fuel into a cracking first set that was only derailed by some severe guitar issues from The Edge during “Pride.” Guitar issues and some visible frustration from The Edge could not stop the show as soon the 200-ft. screen finally lit up with an 8K ultra high-definition red that would set the stadium on fire a few seconds later. This tour is without a doubt the more political of the past few tours and the crowd reaction to the blunt criticism of the current administration went mostly well in Miami, even with an awkward shout-out to Senator Marco Rubio. But would the reception be the same in Tampa a few days later? When the tour got to Tampa, we saw the central Florida city soaking in a day of thunderstorms and torrential summer downpours. At one point in the general admission line, rumors were floating the show may had to be canceled if thunder and lightning were within 8 miles of Raymond James Stadium. Fortunately for the Joshua Tree, God was with Tampa, and the show went on as planned, returning to the city where Tampa Stadium had the original tour in 1987. Even a big, brilliant double-rainbow adorned and decorated the stadium as OneRepublic took the stage to warm up the crowd. Once the thousands settled into their seats, it was clear that this would be a different show than Miami. From the very beginning as Adam Clayton swayed the rhythm of “New Year’s Day,” Bono was already reaching out the more conservative crowd (as he previously did in Texas). “Left, right and in between. Everyone is welcomed here”! 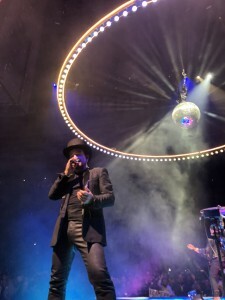 As expected, a few criticisms from fans came during political sections of the show, including a St. Petersburg resident who said: “Don’t they know we just want to hear some good music and no politics? Or a local Tampa couple who bluntly said that Bono “didn’t care for the audience” by assuming they agree with him on everything. 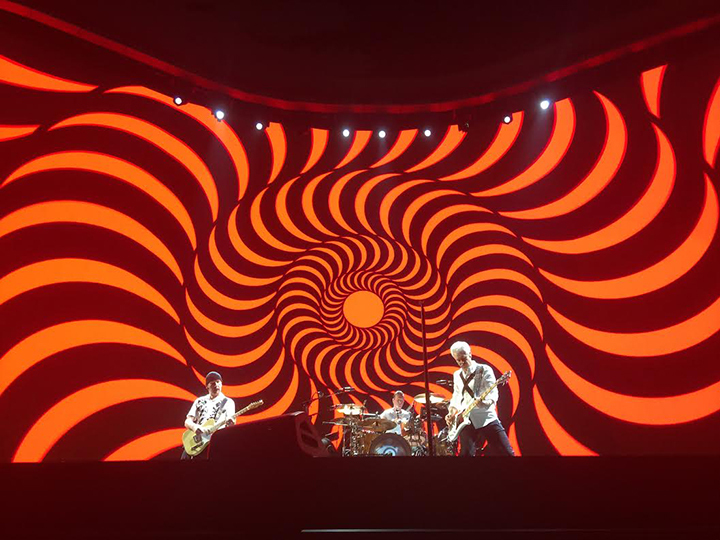 As much as some fans complain that “Vertigo” is overplayed and the song should be dropped, it was clear from the reception both nights, that it set the crowd on fire. Perhaps alternating with “I Will Follow” and a new song, “Vertigo” is likely not going anywhere. All in all, U2 provided the Sunshine State with two magnificent shows, yet very different ones. The politics may differ in these cities, but our love for U2 and Joshua Tree songs is something we all have in common.